Oregon's Trojan nuclear power plant closes permanently after charges of safety violations. Department head Hazel O'Leary takes steps to revitalize the Department Of Energy. The decommissioning of the Trojan nuclear power plant may serve as a model for other plants. 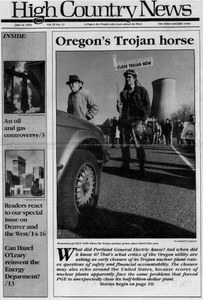 After Trojan closes, Oregon's last nuclear power plant faces an uncertain future. Energy efficiency puts the Sacramento Municipal Utility District into the black. County residents say "no' to a proposal to make Hells Canyon a national park . Several back-country chalets close at Glacier National Park due to sewage problems. Custer National Forest is under pressure to speed oil and gas leasing. The Colorado legislature passes mining reforms after the Summitville gold mine disaster. The Bureau of Reclamation's drawdown of the Island Park Reservoir hurts trout. The Colorado Legislature guts a bill protecting farmers' interests against the oil and gas industry. A homeowner and an environmental group file a suit arguing that jet-boats on the Rogue River violate the Wild and Scenic Rivers Act. Do grizzlies need more protection? A legal battle rages over reclassification of grizzlies from threatened to endangered species. The Greater Yellowstone Coaltion proposes a plan to protect the park as a "National Sustainable Ecosystem." Arizona charges two concessionaires $1.3 million for dumping trash in Lake Powell. Forest Service District Ranger Don Oman is to be transferred from his southern Idaho forest district. Clinton appoints officials to the BLM, Bureau of Reclamation, NPS, US Fish and Wildlife and the Bureau of Indian Affairs. Supervisors ask: Was it coincidence or treachery? Two Montana National Forest supervisors quit to protest reassignment. A federal court in San Francisco rules that timber grown on Washington state lands can be exported. Readers respond to the special issue on Denver (HCN, 5/3/93).